What Makes an Astronomy Story Newsworthy? 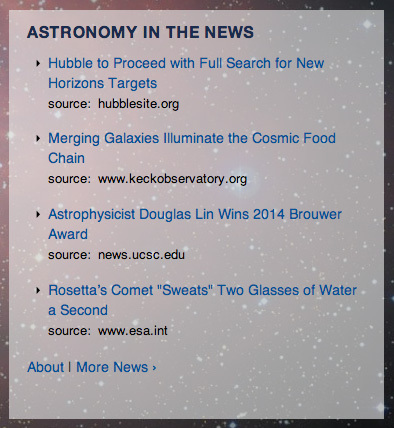 Astronomy in the News, which appears on the AAS homepage, is a curated headline service featuring links to press releases and news articles of potential interest to AAS members and other astronomy enthusiasts. Inclusion does not imply endorsement by the American Astronomical Society. As its name implies, Astronomy in the News points to astronomy-related stories in the news. At any given time, these are the stories that AAS members are most likely to be asked about by students, family, and friends, because these are the astronomy stories that people are likely reading and hearing about in the media. There you'll see a handful of the most recent headlines. The "More News" link leads to pages and pages of older ones. The "About" link leads here. The curator of Astronomy in the News is the AAS Press Officer, who also manages the AAS press-release-distribution service. The AAS emails to accredited reporters and institutional public-information officers (PIOs) press releases on astronomy and space science from universities, observatories, government agencies, and scientific societies. On average we forward about 100 press releases per month. If a release is online at the originating institution's website (which it usually is) we generally link to it from Astronomy in the News too. If we come across something on a website belonging to a media organization that regularly covers astronomy and that regularly sends reporters to our meetings, and if we think it would be of interest to AAS members, and if we haven't already linked to a press release on the subject, we link to it from Astronomy in the News, which is thus a mix of (mostly) press releases and (occasionally) news articles. Each press release that we forward by email to the AAS press list carries a disclaimer similar to the one in the first paragraph above: "Forwarding does not imply endorsement by the American Astronomical Society." Ditto for Astronomy in the News: The AAS is merely pointing to press releases and news reports from recognized sources for the sole purpose of raising awareness among our members and other astronomy enthusiasts. The Society is not endorsing or promoting anything — except for the idea that astronomers like to be informed about what the media are saying about astronomy. Not every news release that we distribute to the AAS press list gets posted to Astronomy in the News. Releases on scientific discoveries, project milestones, major appointments and awards, and widely visible sky phenomena are usually included, but media advisories, invitations to scientific meetings, and other releases narrowly targeted to journalists are usually excluded. Press releases are not scientific papers. They're part of an institution's effort to promote itself to the wider world. The main purpose of a press release is to shine a spotlight on work done by faculty or staff at the issuing institution/organization. They're not strictly objective, and they generally represent only one point of view. Until the advent of the internet, press releases were distributed exclusively to journalists, who used them as jumping-off points for researching and writing stories for which they'd interview multiple sources. Now press releases are available online for the public to read themselves, and often they're the only "coverage" given to some stories. Furthermore, they vary widely in quality. Some are written by public-information officers who have decades of experience in science journalism, while others are written by student interns. So, caveat emptor. News articles vary widely in quality too, which is why we generally link only to stories published by media organizations that we deal with regularly and whose authors we know either personally or, at least, by (good) reputation. Finally, a few words on the nature of science as it relates to science news. Most press releases and news articles about science describe new discoveries. Discoveries happen at the edge of what we know and are often made using tools and techniques that push our technologies and perceptions to the limits of what's currently possible. Consequently some discoveries, including some of those touted in press releases and news reports, later turn out to be wrong. This isn't bad — it's good! It shows how science is a self-correcting enterprise, one that gets closer to the right answer as more data are accumulated and more theoretical work is done to interpret the data. Scientists are born skeptics, not only of others' work but also of their own, and they're among the few professionals who are happy to admit when they've made a mistake — because recognizing when you've gotten something wrong often leads to getting it right. If you see a headline in Astronomy in the News that causes you to think, "That can't be right," well, maybe it isn't. But maybe it is, in which case astronomers will have taken another step in advancing our scientific understanding of the universe.